An annual fund is the money a nonprofit raises on an ongoing basis throughout the year. It’s generally used to cover the costs associated with a nonprofit’s day-to-day functions so it can stay up and running as it promotes other campaigns for specific projects and events. Apart from covering a nonprofit’s operational costs, one of the main goals of annual fundraising is to deepen existing donor relationships. A large part of annual fundraising is therefore focused on strengthening ties to existing donors so that they will give again. How do you grow your annual fund? Nonprofits raise annual funds through a comprehensive set of strategies known as annual giving campaigns. They consist of a variety of fundraising efforts centered around targeted donor solicitation and stewardship to meet the broader annual fund goal. Download "Annual Giving: Prospects and Approaches" for free now! 1. Create a page on your website. 2. Invest in fundraising software. 4. Create a membership program. 5. Set up child campaigns. 6. Allocate your staffing resources. 7. Map out your marketing strategies. 9. Use multiple outreach channels. 13. Create customized giving levels. 14. Make a year-end appeal. 15. Have a pledging program in place. 16. Promote matching gifts to constituents. 20. Organize small annual fund events. 21. Keep your annual events interesting. 22. Celebrate with a closing event. Your annual giving campaign has unique aims. Because you’re raising money for your operational expenses, it’s an opportunity for your donors to support your organization and your cause more generally. A campaign-branded donation page allows donors to contribute specifically to the aims of your annual campaign. On the other side of the coin, since annual campaigns have less clearly defined goals, donors will be giving more on faith than they would when giving to your other campaigns. A page with information about your annual campaign can illustrate to donors why this effort is so important to your organization’s functioning, which may make some feel more confident about giving to your cause. Use your online donation software to create a campaign-branded donation page and incorporate it into your website. A brief description of your organization and mission. A blurb about what goals you hope to achieve. A tentative campaign calendar (especially important if you’re hosting events). A place for progress updates throughout the campaign. A donation form where people can give specifically to your annual fund. In all correspondence about your annual giving campaign, make sure to include the link to the webpage to provide supporters with more information and to give them the opportunity to donate online. 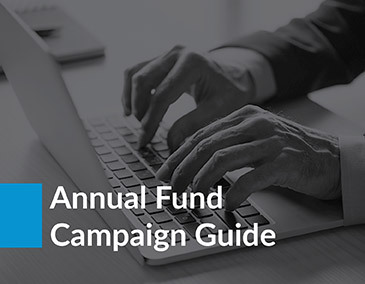 MAIN TAKEAWAY: Your organization should create a campaign-branded web page on your website dedicated entirely to the goals and strategies of your annual fund. Check out these top nonprofit website design firms! 2. Invest in the Right Fundraising Software. With the right fundraising software resources, your nonprofit can empower your annual fund campaign to reach more donors than ever before. Fundraising software allows your organization to do anything from create customized giving forms, enable text-to-donate functionality, set up crowdfunding and peer-to-peer giving pages, identify prospects for giving, and much more. Even better? Because fundraising software allows your team to accept digital donations, you’re able to collect and track donor data as your annual fund campaign progresses. This means that throughout the campaign, you’re able to see when it’s necessary to course correct. Once the campaign closes, you’ll also have a wide-ranging view of which strategies worked and which need improvement next time. There are many types of fundraising software solutions that your team can take advantage of. Online giving page building, customization, and curation. No matter what your nonprofit wants to accomplish, there’s a fundraising software solution out there for you. Be sure to find the right one for your team as you plan your annual fund campaign! MAIN TAKEAWAY: Your nonprofit should adopt fundraising software during your annual fund’s planning phase. Elevate your annual fund appeals with software! As the arithmetic of fundraising states, major gifts will make up a large proportion (about 60%) of the funds you’ll raise during your annual campaign. The rest of your funds will come from a lot of smaller gifts from your donor base. Thus, a big part of your annual campaign should be centered around ascertaining what kinds of gifts your donors are able to make. 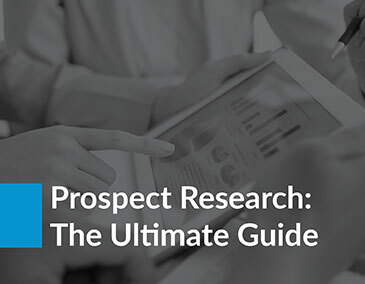 Prospect research will help your organization focus in on those who have the financial resources and philanthropic drive to be major gift donors. That way, you can target your annual campaign efforts and allocate your resources toward cultivating these prospects, which will help you reach your annual fund goals. You’ll want to find those in your base with the capacity to give a large gift and the greatest affinity for your organization. Turn to your donor database and study the data you have on file. A donor’s previous giving history with your nonprofit and with other organizations. Wealth indicators (such as the amount given in previous donations, real estate and stock ownership, etc.). If the donor is philanthropically-motivated in other ways (for example, if they frequently volunteer with nonprofits or have served on a board of directors). Integrate a robust wealth screening service with your donor database for the deepest insights. MAIN TAKEAWAY: Conduct prospect research on your existing base to get an idea of donors’ giving capacities and to locate potential major gift donors. Get 200 of your annual fund prospects screened for free! A membership program rewards donors who join with special perks in exchange for their donations. Contributions are given in the form of membership fees. Having a membership program in place can really incentivize donors to give. Sometimes donors will need a little more motivation to give, and that’s okay! Because it rewards them for their donations, a membership program might give donors that reason. Additionally, membership programs foster a sense of community and camaraderie among your supporters, since all members are working towards a common goal: helping your nonprofit succeed! Finally, since your organization can set the membership fee, you’ll have more control over the quality of donations you’ll receive. To create a membership program, first think of what perks you can offer to motivate donors to join. Offer members an email newsletter with first access to news about your organization or exclusive content. Welcome members with a small packet of trinkets branded to your organization (like T-shirts, calendars, mugs, etc.). Host a fundraising event exclusively for members or give members special perks at your other events (for example, free drinks and the best seats in the house at your annual auction). The possibilities are endless. Just make sure to emphasize what rewards donors will receive when pitching your membership program, so they won’t be able to resist! MAIN TAKEAWAY: Setting up a membership program is a great way to create community among your supporters and offer donors a little more incentive to give. Learn more about nonprofit membership programs! Child campaigns refer to a set of smaller, more targeted fundraising campaigns that flow into the larger annual giving campaign. Because child campaigns have a more definitive goal, they can help your organization collect valuable data to be used in your annual fund campaign that will give you more granular insights into your donor base. By hosting more targeted campaigns, you’ll get a better idea of each of your donors’ interests and preferences and, more generally, which projects and causes are most compelling. You can then use this information to approach donors in the most relevant and compelling ways throughout the duration of your annual campaign. Your organization is likely already hosting child campaigns, and you didn’t even know it! To incorporate them into your annual fund strategy, think about how the goals you want to achieve with your more targeted child campaigns relate to the broader goals of your organization’s annual campaign. As you’re hosting your child campaigns, make sure to collect all of the donor data you can. The easiest way to automatically track donor data and generate detailed reports is by using a nonprofit CRM. After you host your child campaigns, take a good look at your donor data and use it to guide your annual campaign strategies. MAIN TAKEAWAY: Hosting specific, targeted child campaigns will give you ample opportunities to collect valuable donor information for use in your broader annual fund campaign. Your annual giving campaign is perhaps the largest effort your organization will execute. You won’t be able to do it alone! It’s important to have a competent, cross-functional team on your side as you work to pull off your annual fund campaign. Having a dedicated team in place will help ensure that you are assigning each campaign component equal weight and that you are not stretching your resources too thin. As the saying goes, two (or three, or more) people are better than one. Using a team approach not only spreads out the workload but also lends fresh perspectives to further improve your campaign. At the least, most annual fund campaigns consist of three major components: marketing and outreach, direct asks, and fundraising events. Appoint experienced staff members to plan out and manage these efforts to ensure that they are effective. Additionally, ensure they are familiar with your donor data and software platform. Additionally, create a plan for who will take over certain responsibilities if the people managing them leave in the middle of the annual fund campaign. MAIN TAKEAWAY: Gather a reliable and experienced team to help you manage the many moving parts of your annual fund campaign. In order to give to your annual fund campaign, your supporters have to hear about it! As such, you’ll need to have a plan in place regarding how you are going to market your campaign. Plan ahead to figure out what assets you’ll need and what technologies or avenues your marketing strategy will use. You should think about whether you are mostly concerned with web- or mobile-based outreach or if traditional marketing strategies will be your main focus. You’l thank yourself later as your annual fund campaign rolls out smoothly! Take time to think through the ways you want to spread the word. Social media posts: Shout out your campaign on Twitter and Facebook. Email blasts: Include a reference to the campaign in your email newsletter. Direct mail promotions: Send pamphlets or brochures explaining the campaign to your donors. Traditional print ads: Take out an ad for the campaign in your city’s newspaper, or create a billboard or bus stop ad. Don’t forget to include a link to your annual giving campaign’s website! MAIN TAKEAWAY: Be fully prepared to market your campaign with a comprehensive marketing strategy. Your annual giving campaign will consist of a diverse set of fundraising efforts and strategies, each with a lot of moving parts. As a result, they’ll require some strategic timing. To help you keep track of what is happening when, you should design a campaign calendar that clearly outlines when you will be implementing each piece of the larger puzzle. If you know exactly when each phase will be rolled out, you can make sure that you have everything you need beforehand instead of scrambling at the last minute. Additionally, laying everything out in a calendar will give you a bigger-picture overview of your campaign and help you figure out where you may need to focus more attention. Remember, every nonprofit is different, and the calendar that works for one may not be ideal for another. Therefore, it’s best to first discuss with your team what they feel the best timing strategies are for your particular nonprofit. It might also be useful to include holidays or other broader movements that you might be able to tap into on your calendar. For example, if you have an environmentally-focused nonprofit, it’s probably a good idea to highlight Arbor Day and Earth Day on your calendar so you can make sure to incorporate them into your outreach. MAIN TAKEAWAY: Coming up with a campaign calendar helps streamline and organize all of your annual fund campaign’s moving parts while also helping your team ensure they are fully prepared. Screen 200 of your annual fund donors for free! Your donor base isn’t one unified collective. Each donor is a unique individual with particular interests and preferences. That means not all of your donors will want to interact with your organization in the same way. For example, while one millennial donor might love hearing from your organization through social media, email, and text, a donor in an older demographic might prefer the intimacy of a handwritten note or personal phone call. When you take a multi-channel approach, you’re more likely to reach your donors where they want to be reached, which helps make them feel cared about and valued. As a result, they’ll be more likely to engage with your organization. Make sure you have the right tools handy to efficiently communicate with donors through multiple mediums. Study your donor data before the campaign to get a better idea of where each donor might like to be contacted and use this information to guide your outreach. MAIN TAKEAWAY: Take advantage of a variety of communication methods to effectively contact your donors where and how they like to be reached. Segmenting a list refers to when nonprofits use certain criteria to break down their donor base into smaller categories. Since each group of donors has a different relationship with your organization, not all of the correspondence you send out about your annual campaign will apply to each donor. For example, while a recurring donor might want to upgrade giving levels, a volunteer who has yet to make a monetary donation to your organization definitely wouldn’t be ready to take this step. Breaking down your list makes it much easier to target different groups with the relevant information that’s most likely to engage. Plus, the more granular you can be with your communications, the more effectively you can cultivate and steward donors at different stages in the giving process. Segmentation allows you treat them as the individual people they are! To segment out your list, first think of all the major constituent groups your organization wants to target. Next, categorize each donor into the appropriate group. This process will be much more efficient with nonprofit CRM software, which can automate list segmentation based on the donor data you’ve collected. The last step is to strategize about how you want to approach each group. How do you hope to further mobilize each to help you reach your annual fund goals? MAIN TAKEAWAY: Breaking down your donor list into distinct categories can help you design a targeted outreach approach that will encourage engagement. Your annual campaign is all about forming more meaningful relationships with donors. When you get to know donors and connect with them on a personal level, they’ll feel valued by your organization. Therefore, make sure that when you are asking for donations, you are demonstrating that you know and care about your donors. They’ll be more likely to give and even to become recurring donors. Recurring givers will be much more valuable to your nonprofit in the long run. In fact, recurring gift donors, on average, give about twice as much as major gift donors. Plus, nobody likes to be treated like just a source for funds. If you go into your annual campaign with a transactional mindset, you run the risk that you might alienate or tire out your donors by asking for too much. For this strategy, you’re really going to want the help of a donor database! Because all donor data will be tracked in one place, your data sources can inform each other to give you the most detailed insights into your donors. You can then use these insights to better personalize your outreach. Always use donors’ names (spelled correctly!) in your correspondence, and include other personal information if possible. For example, if you have a note in your CRM that one of your donors made a donation around a certain holiday last year, you can reach out to them around that holiday this year to thank them for their past support and to ask if they’d be interested in contributing to your cause again. MAIN TAKEAWAY: Taking a personal approach to donor solicitation demonstrates that your nonprofit values its donors as more than just sources of funding, which will ultimately help you raise more in the long run. Learn more about how your donor database can help! Increasing donor retention rates is one of the main focuses of the annual fund campaign. It’s much easier and more cost-effective for nonprofits to focus on cultivating the relationships with donors who’ve already given to the organization than it is to build new relationships from scratch. Think about it: If you’ve already convinced a donor to support your cause once, it will take less to persuade them to give again. You’ll be able to skip the initial stages of the stewardship process, saving your organization time and money. Plus, as mentioned earlier, recurring donors are much more valuable for nonprofits, because they give more over the span of their relationship with the organization than a donor could give if just contributing once. When your organization encourages recurring giving, you’ll be making a conscious effort to cultivate one-time donors into donors who give again and again. So as you’re making your direct asks, emphasize recurring giving to your donors. For the best chance of success, you’ll want to make setting up recurring giving as convenient as possible. Make sure that you include a recurring giving option in your online donation tools. Additionally, most nonprofit CRMs with donation processing tools will allow you to store donors’ credit card numbers and automate payments when it’s time to make a recurring gift. Just make sure to get the donor’s explicit permission. MAIN TAKEAWAY: Encouraging recurring giving will help you to cultivate valuable and long-standing relationships with your existing donors, while also bringing new ones into the fold. Not all donors are capable of giving the same amount. Thus, it’s necessary for your organization to meet its donors where they are financially. By offering donors multiple giving levels, you’ll enable more supporters to make a contribution, thereby increasing your funds. Plus, when you let donors know that even the smallest contributions can make a difference, it shows them that your organization values all donations, regardless of size. You can also suggest a gift size for donors to give, which can be a great strategy for making more directed asks. Oftentimes, donors will have no idea how much they should give. Having a better idea of what’s expected from them might compel more of them to donate. While not everyone will give the suggested amount (some might even give more! ), when you know exactly how much you want to raise from each donor, you can better plan out how you’re going to reach your goals. This strategy applies mainly to your online donation form. As you’re creating your form, feature multiple, preset giving levels as well as a field where donors can submit a custom donation amount. It can also be helpful to tell donors exactly what each donation amount can do to further your cause. Telling donors how their funds will help your organization remain operational makes donations more tangible. If you are asking for a specific amount from a donor, you’ll want to examine their wealth indicators and philanthropic motivations. You’ll then be able to estimate a general capacity score that will help determine what quality of gift each donor can give. Keep in mind: because they’re usually calculated from an incomplete set of data, capacity scores are by no means a perfect science. Instead, they’re rough estimations that can help you categorize your donors into different giving levels to better tailor your asks. 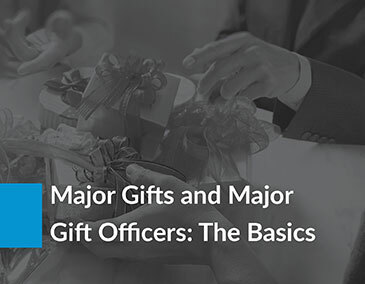 MAIN TAKEAWAY: Customizing gift levels and asking for specific gift amounts gives donors a range of options for how to financially support your organization, thereby enabling more donors to contribute and increasing your nonprofit’s funds. Sending out end of year fundraising appeals is a smart idea for all kinds of fundraising campaigns, but they can make an especially powerful impact on annual fundraising campaigns. Keeping up momentum during an annual fund campaign can be difficult since these campaigns need to make the case for donors to provide unrestricted gifts. For this reason, your team should capitalize on the holiday spirit of year end fundraising by sending out annual fund appeals during this fast-paced fundraising time. End of year annual fundraising appeals are a great way to secure a gift from supporters who have been hesitant to donate earlier in the year. They’re also an opportunity to secure a second (or third!) gift from donors who are feeling especially generous during the holidays. Another way you can make the case for a year end annual fund gift is to remind donors it’s their last chance to secure a tax deduction via charitable giving. When planning your annual campaign, make sure you have ample time and resources to put toward your year-end appeals. A team dedicated to donor solicitation. The ability to process many different types of donations. A plan in place for efficiently following up with donors. Your year-end appeal is your chance to remind supporters of how much your nonprofit has done over the past 12 months and inspire them to contribute to your efforts. Make your appeal letters heartfelt by including a real story of how your organization has impacted the community you serve. A high-quality photo or a short campaign video can also help get your message across while engaging readers. Be creative! For more inspiration, check out Razoo’s guide to year-end fundraising on their platform. MAIN TAKEAWAY: Use your year-end appeal to steward donors and solicit gifts for your annual fund. Since many individuals are already feeling charitable during the end of the year, all you need to do is remind them why your cause is so important. Find out Averill Fundraising Solutions's top annual fund appeal strategies. Some donors will want to support your annual fund by making a monetary donation, but won’t be capable of giving at the time of your ask. A pledging program gives them more flexibility. With pledges, donors in this situation can essentially make a donation at the time of your ask, but won’t have to deliver the gift until they’re capable of doing so. Without the ability to accept pledges, your organization might miss out on a good chunk of contributions. While donors might still want to give in the future, they’ll be much less likely to do so if your organization hasn’t established clear guidelines. A pledge program establishes a set process for agreeing on the terms of the pledge and following up with pledges who have yet to make their gifts. Your organization will definitely want to appoint someone on your team to be in charge of pledge management. Setting the terms of the pledge. Pledges can either be unconditional (meaning they’re made by a set date) or conditional (meaning they’re made once an organization has fulfilled a certain condition). Properly recording the pledge for accounting purposes. Following up with pledge donors to ensure they make good on their pledges. With a system in place for managing pledges from the beginning, you should be able to increase your fundraising results. MAIN TAKEAWAY: Establishing clear guidelines for how to manage pledges will help your organization be more flexible in how it raises funds. Did you know that there’s a way that your nonprofit can double the impact of your donors’ gifts without them having to donate again? With matching gifts, donors who work for companies with employee matching gifts programs are able to see their charitable donations doubled or even tripled. However, not everyone knows about these programs, and even if donors are aware that their employer matches gifts, they may not know how to get their gifts matched, their employer’s deadlines for submitting a request, or other important information. Luckily, with matching gift software your supporters can easily research their matching gift status, details on how to submit their request, and the forms they’ll need to make their request to their employers. Before your annual fund campaign begins, be sure to adopt matching gift software such as a matching gift database. Discover if their employer matches gifts. Find out the minimum and maximum donations allowed. Learn when they need to process their request. Your nonprofit can also use matching gift software to identify prospects for your annual fund campaign, allowing you to promote matching gifts to them directly. MAIN TAKEAWAY: With matching gift software, your nonprofit can boost annual fund giving by encouraging matching gifts among supporters. 17. Offer other engagement opportunities. As mentioned before, fundraising will be a big component and goal of your annual giving campaign. However, it’s more important to view the campaign as an opportunity for building meaningful connections with your donors. To forge the deepest relationships with supporters, offer them other opportunities to engage with your organization aside from making monetary donations, such as the chance to volunteer or take an advocacy action. Offering other engagement opportunities allows you to reach out to donors without always asking, which will lead to better donor relationships. Plus, some supporters might want to contribute to your annual giving campaign but won’t have the capacity to make a monetary donation. With various engagement opportunities, these donors can still get involved with your organization, giving you a bigger and more diverse base of contributors to work with. Think about other areas in which your nonprofit can encourage supporters to get involved. For example, you can call your supporters to an advocacy action, like signing an online petition. That way, they can stay engaged with your organization without having to empty their pockets. Encouraging supporters to volunteer at or attend your next fundraising event. Asking supporters if they’d like to participate in a peer-to-peer fundraising campaign. Requesting that supporters follow your pages on social media or subscribe to your email newsletter. Keeping donors engaged outside of donations can result in even more donations, and things like fundraising events or volunteer opportunities are perfect for engaging. One thing to consider is using software that allows you to receive donations as well as engage supporters. For one example of software like this, you can see Razoo’s premium features here. It can be helpful to analyze your donor database to get an idea of how your supporters have previously been involved. If you can get an idea of your supporters’ interests and skills, you can better target your outreach by offering each the engagement opportunities that will appeal to them most. MAIN TAKEAWAY: Offer multiple ways for your donor base to engage with your organization to help foster and deepen donor relationships. One of the biggest missteps that a nonprofit can make is failing to put to use the valuable data they collect over the course of their annual giving campaigns. Just like your more targeted fundraising projects (such as capital campaigns), your annual giving campaigns are great opportunities to collect and apply informative data to help your organization hone its fundraising strategy. When it comes to knowing your community, this starts by putting into practice prospect research methods, monitoring the success of your campaign as it progresses, and conducting A/B testing of communications channels, among other strategies. Evaluating the data your nonprofit collects isn’t just something that should take place after the campaign closes: your team should monitor your data during the planning phase, once your campaign kicks off, and after the end of the year. Maintain a clean CRM so your data remains accurate. Evaluate data at benchmark periods over the course of your campaign. Recruit a nonprofit consultant to help your team understand fundraising data. Above all, your nonprofit should take data evaluation seriously! Without heeding annual giving data, your fundraising efforts will amount to basic guesswork rather than informed strategy. MAIN TAKEAWAY: Always collect and evaluate informative annual giving data throughout your campaign. Nonprofits face a common problem of limited time and resources, especially when it comes to an effort as big as planning an annual campaign. With corporate partnerships, a business sponsor will help your organization fund and market your annual event. A corporate sponsor will bring your event more visibility. They’ll also usually help out by donating money, goods, or services. Teaming up with a business sponsor will take some of the stress of event-planning off of your nonprofit, so you can throw an amazing event without sacrificing your other annual campaign efforts. With this strategy, it’s all about who you know! It will be much easier to form partnerships with corporations that you have a personal connection with. Take a look at your CRM software’s database of donor information. Do any of your staff, board members, or loyal donors have internal connections at big-name corporations? If so, this is a good place to start. Once you have a list of potential corporate sponsors, do a little research. You’ll want to see if these companies have programs in place for charitable giving. MAIN TAKEAWAY: Corporate sponsorships can be a valuable (and lucrative!) addition to an annual fund campaign. Use your existing donor base to forge connections and reach out to engage corporate partners. Check out Double the Donation's Ultimate Guide to Corporate Philanthropy! 20. Organize multiple smaller annual fund events. Planning one huge event (like an auction or gala) can exhaust an organization’s resources. Planning many smaller events breaks event planning down into more digestible chunks, making them more manageable efforts for busy nonprofits in the midst of their annual campaigns. Additionally, hosting multiple events will give your organization more opportunities to interact with your donors face to face. You can even encourage your supporters to host their own fundraising events to benefit your annual fund campaign! Start by enlisting the help of an event planning fundraising software, which will make managing your events much easier. How many events you’ll host. What type of events you’ll host. What you’ll need for each event. Once you have a better idea of which events you’ll host, you’ll want to make a tentative calendar so you can properly allocate your resources and start marketing your event to your donors. MAIN TAKEAWAY: Planning multiple smaller-scale events (or mobilizing your supporters to do it instead) is a great way to foster continued engagement without exhausting your organization’s resources. It can be very beneficial for your organization to host the same annual event every year, because you can constantly improve your strategies. However, nobody wants to attend the exact same event year after year after year. You don’t want to run the risk of becoming so predictable that you bore your supporters to tears. Introducing a surprise or twist is the best way to combat this problem while still reaping the benefits of holding an annual event. This way, you can preserve the same overall event structure while also maintaining the flexibility to incorporate new and novel components each year. Think about your annual event and get your creative juices flowing. What new twist can you put on it to keep supporters on their toes? For example, if you always host a charity auction (live, silent, or online), you could surprise guests with a celebrity emcee or add a twist to your auction by making it a penny social. Another option is to get creative with your auction items; every year you can switch up the theme to provide guests with something unique and different. Ideally, you’ll want to think up a surprise so remarkable that donors will talk about it for years to come. Let your imagination run wild! MAIN TAKEAWAY: Switching up aspects of your annual event will keep things interesting — and keep supporters coming back! 22. Host a celebratory event at the end of your campaign. Your staff and board, major gift donors, volunteers, members, and more have all worked super hard to help your organization reach its annual fund goals. If you have the resources to spare, once your annual fund campaign closes you can host a celebratory event to reward everyone’s contributions and make them feel appreciated, which is an integral part of the stewardship process. Additionally, it will be yet another opportunity for you to interact with your constituents in person and form deeper relationships with them. You’ll want to schedule this event for the beginning of the year, so it doesn’t interfere with your nonprofit’s year-end appeals. However, start planning well in advance to make sure you can procure all of the necessary resources. Decide what type of event you want to throw and set a date. Then, determine your guest list. You probably won’t be able to accommodate everyone who gave to your annual fund. Instead, focus on the big contributors who went above and beyond to help you reach your goals. MAIN TAKEAWAY: If it’s feasible, throwing a celebratory event is a wonderful way to recognize all of the hard work that your supporters put into your organization throughout the year. “Thank” and “you” are two words that never go out of style. Not only is thanking your donors an integral part of the stewardship process, but it’s also just plain old common courtesy. Thanking donors is yet another way to make them feel valued and strengthen your relationships with them, which is a primary goal of the annual giving campaign. Additionally, providing donors with donation receipts is good practice and often required by law. Many donors will want to claim their charitable donations as tax deductions, and donation receipts are the best proof of charitable giving. Craft some thank-you note templates before the campaign to help you streamline the acknowledgment process. If you’re using a donor database with online donation capabilities, most platforms will automate sending out thank-you letters and donation receipts right after a donor has made a contribution. You’ll probably still want to follow up by sending a more personalized thank-you note, but at the very least no donations will go unacknowledged. For offline donors and following up with online donors, make sure you send acknowledgments out no later than two days after you receive the donation. MAIN TAKEAWAY: Aside from being common courtesy, thanking your donors goes a long way towards making them feel cared for and appreciated. Check out some thank-you letter best practices! 24. Customize follow-ups based on donor interest. As we mentioned previously, one of the biggest ways to keep donors coming back is to show that you are interested in who they are rather than just what they give. Personalizing your post-campaign outreach and follow-up methods are therefore a crucial part of the stewardship process. When donors feel like you have taken the time to understand their preferences, they will be much more likely to remain supportive and engaged. Your nonprofit CRM software is again the hero of the hour here! Let all of the donor data you collected during the annual fund campaign inform your follow-up efforts. You can analyze this information to see which marketing and outreach strategies worked and which could be improved. You can then utilize this data to optimize your strategies for your next annual fund campaign! MAIN TAKEAWAY: Taking the time to personalize your follow-ups with each donor will foster goodwill and help you retain them for many years to come. One of the most important tools nonprofits have at their disposal when designing successful annual fund campaigns is prospect research. Can’t wait to learn even more about annual fundraising? Looking for even more annual giving tips and strategies? Visit MobileCause to check out their annual giving guide to answer any questions your team has as you plan your next campaign! Learn more about the ins and outs of annual giving! In fact, according to the arithmetic of fundraising, major gifts will account for 60% of your nonprofit’s funds!